Anger Management Training Materials are designed to help you train your staff how to understand, identify and control anger. 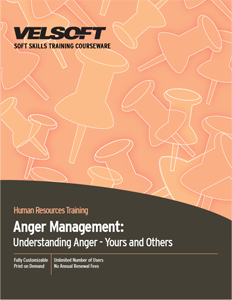 Teach employees the anger process, understanding behavior types, the cost and pay-offs, anger coping strategies and much more! Seeing is Believing This sample manual to teach Anger Management is in MS Word format. Anger is a tough subject. We all feel anger differently and deal with it in our own way. Likewise, most of us could use some help with managing it. Anger Management Training Material can be delivered as a one-day course, and will help you teach staff how to identify their personal approach to anger and create coping strategies that work for them. Information is also included on skills that can help reduce the impact of angry situations, such as communication and managing aggressive people. Anger Management Training Materials include a pre-assignment, detailed instructor guide, student guide, pre and post assessments, quick reference guide, PowerPoint slides, and more. If your students like to learn from their mobile devices, ask about our blended learning opportunities. Want to see the topics you will cover in this course? Check out the Anger Management Course Outline.